This is the first remedy for the paralysis caused by exposure to cold, especially dry cold winds. Facial paralysis accompanied with coldness, numbness and tingling. Aco. suits well in the beginning and is followed well by Caust. Rhus Tox. or Sulphur. Facial paralysis of right side, from exposure to cold, particularly to the intense cold of winter. It is suited more when the paralysis has become chronic and refuses to yield to Aconite. It is useful in the facial paralysis or in ptosis (paralysis of upper eye-lids). It has also paralysis of single parts—face, tongue, pharynx, eye lids etc. It is also useful in paralysis, after typhoid, typhus, apoplexy etc. R.T. is useful when facial paralysis is brought on by getting wet or exposure to damp and cold atmosphere, lying on the damp ground. It is also useful in paralysis after apoplexy. It is more useful in chronic cases. Facial paralysis, more on left side. Distortion of the mouth from facial paralysis. It is useful in the beginning. Paralysis from exposure to a damp and cold weather, lying on the damp ground. Not much useful in chronic cases. Paralysis of the face with circumscribed redness of the cheeks. Paralysis of the lower jaw. Distortion of the mouth, it is drawn to one side. It is one of the most important remedies in post-diphtheric and infantile paralysis. It is indicated only in functional paralysis. Sensation of stiffness in muscles of the face. Paralysis of upper lip after prolonged conversation. The muscles of the face seem to be contracted, especially around the mouth, making it difficult to speak, stiffness of the jaws, the jaw are locked. Lower jaw wags sideways, no control over it. The mouth remains partly open and saliva runs out freely. The child has a silly vacant look. Facial paralysis. Facial muscles distort on attempting to speak. Facial paralysis from catching cold, especially of robust and sanguineous people. Paralysis of face, left sided. Paralysis of tongue and pharynx. 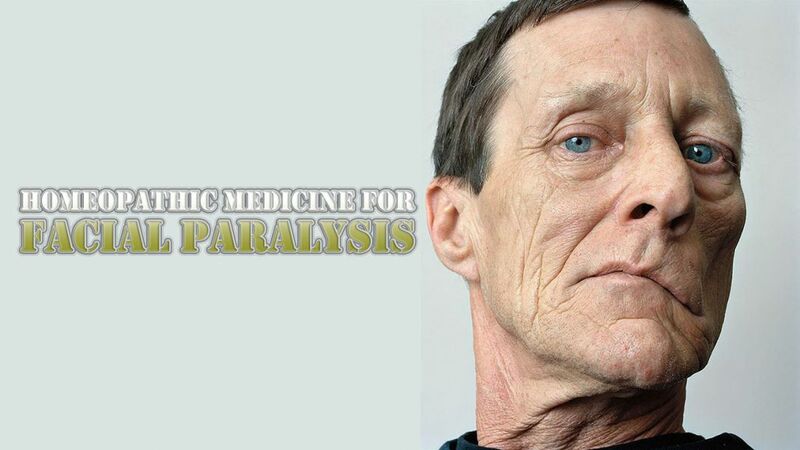 Paralysis of right side of face.